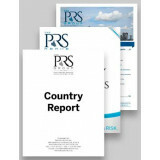 Country Forecasts is a 508-page publication providing a four-page summary of forecasts and data for each of the 100 countries monitored by Political Risk Services. Each volume also includes extensive statistical and ranking tables with PRS forecasts and macroeconomic data. 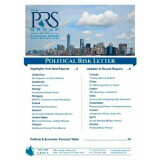 Published semiannually (in April and October), this is an annual subscription. This publication is available in print or as a download via e-mail in PDF format. The list price covers a one-year subscription, including two volumes. Shipping/handling fees apply according to print delivery location (please select below). Appropriate sales tax also applies. Back issues are also available, but only as PDF files (contact PRS for details). SPECIAL NOTE: Single volumes, as well as academic prices are available by contacting PRS at info@prsgroup.com or at +1-315-431-0511, Ext 0. 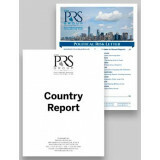 Country Forecasts: Published semiannually, this 508-page publication includes a four-page summary of the forecasts and data for each of the 100 countries monitored by Political Risk Services.